I bought this because I found myself really enjoying writing reviews for terrible movies. I found I had so much more to say about them than the good movies. So when I found quite possibly the worst movie I’d seen in a decade for under $10, I thought ‘why not’. Green Lantern stars Ryan Reynolds as Hal Jordan, a cocky pilot who never takes anything seriously. He is chosen by an intergalactic police force called the Green Lantern Corps to be the protector of Earth and its surrounding universe. He is introduced to the Green Lanterns’ home planet of Oa, where he undergoes training on how to use his new powers, specifically how to use his new ring that allows him to create anything his imagination desires. Hal must become more than the cocky unreliable pilot he has always been if he is going to save the world from an unstoppable force known as the Parallax, and save his childhood love, Carol Ferris (Blake Lively). I like Ryan Reynolds a lot, but he needs to choose better roles. I have only liked a handful of his films, despite generally liking his own performance. He is charming and good looking– everything you’d want in a leading man– but he is usually the best part of a crappy film. In Green Lantern, he isn’t even that. He is so badly miscast as Hal Jordan, I never took him seriously when Hal needs to live up to his potential. Ryan Reynolds always seems to be playing a slacker, and it is very difficult to see him as anything else, let alone the protector of our galaxy. I’m also not sure how he and Blake Lively were meant to be childhood friends, he looks at least 15 years older than her and if they were dating at any time in the past, I’d have been calling the authorities. Bradley Cooper was rumoured to be up for this role at the time of casting, and I feel like he’d have done such a better job. One of the things I did like about this film were the effects. The things that Hal’s ring can do are really cool, and look great on screen. I also really liked how this movie pokes fun at the stupid disguises that superheroes use to conceal their identity. Hal has this really dodgey mask that barely covers any of his face, and it was refreshing to see Blake Lively point out how stupid it was and recognise it was him straight away. I have a tough time believing any of these heroes would be able to conceal their identities that well. With all of the face recognition software out there today, as long as their eyes are showing, it would not be that hard to figure out who was behind the mask. The only hero who would be safe is probably Spiderman. 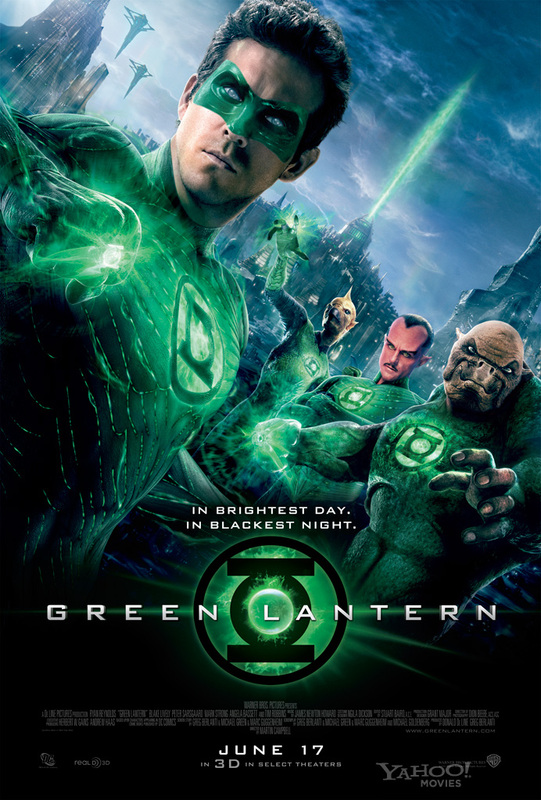 Green Lantern suffers from a silly plot that butchers what is a really interesting idea. I like that there is a group of intergalactic policemen running around keeping us safe, but this film butchers things pretty badly, with an uninspiring lead and a cast with nearly no chemistry. Oh, Ryan Reynolds… You seem like such a likable guy, but you do nothing for me movie-wise. The only film I’ve ever really liked you in is The Proposal, and I think that has more to do with Sandra Bullock’s performance than your own. Perhaps you just need a better agent? Or more outside input into the roles you choose? I just feel like you could do better, and Green Lantern is not it. I’m no expert in comic book films. I like what I like, and that is often not influenced by the source material because I haven’t read many of the comics. Usually these superhero movies make me curious about the original characters. I’ve been inspired to read Batman and various Avengers titles because of their movies (I’ll actually get around to reading them someday… my bookshelves are overflowing now thanks in part to this blog), but Green Lantern does nothing to pique my interest. Reynolds’ Hal Jordan is a pale imitation of better film heroes, and the story is dull. It would be unfair to blame the failure of this film entirely on Reynolds. In fact, he’s rather likable (as always). It’s just that he never comes across as a superhero. I can’t quite put my finger on why. Maybe it’s because Jordan is first presented as a cocky, unrepentant douche, but then is never given a convincing enough reason for his change of heart and acceptance of his Lantern duties. Maybe it’s because he’s just too witty all the time, and this undermines the scenes when he needs to be serious. Whatever it is, something just isn’t clicking. I also question the choice of Blake Lively as Jordan’s childhood sweetheart, Carol Ferris. For one thing, Lively looks way too young to be contemporaries with Reynolds. There’s an 11 year age difference between the actors in real life, and this is apparent with their on screen characters (in fact, Hal looks at least 15 years older than Carol, so it’s icky to think of them dating in the past). I do give Carol credit for being much smarter than most comic leading ladies. She recognizes Jordan in his lame Green Lantern disguise, which puts her observational skills way ahead of Lois Lane’s. Still, it’s apparent that Lively was cast primarily as eye candy. The role would have been better served by a more mature actress who actually looks like she grew up with the leading man. The special effects here are also hit or miss. Hal Jordan’s Lantern costume is good; the mask looks distractingly fake. Oa, the Green Lantern Corps home planet, is well done; the Guardians, Oa’s overseers, are really laughable. I wasn’t crazy about how the primary villain, Parallax, was portrayed. He looked like a worse version of Galactus from Fantastic Four: Rise of the Silver Surfer. Actually, I think I’ve just figured out why I hate this movie so much– it reminds me too much of Fantastic Four. I really can’t wait to watch a good comic movie again.